It's funny because as I contemplated what to focus on in this blog for September, I reflected on the 10th anniversary of the 9/11 attacks, and the spate of natural disasters the United States faced throughout the summer. When I read about the Presidential Proclamation, I figured my decision had been made for me! 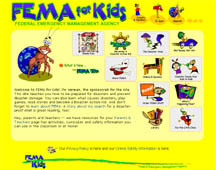 In my children's book and resources blog, KidsRead, I reviewed the FEMA for Kids website (http://www.fema.gov/kids/). The Federal Emergency Management Agency sponsors a page full of materials to help children prepare for and learn about disasters of all kinds through activities, games, and downloads (including checklists to print). If knowledge is power, children are sure to feel empowered by the resources on this website. And with an attractive layout, engaging cartoon characters, and materials appropriate for a range of age groups, getting kids to use the site regularly should be no problem. Use it in a classroom, as a family, or just assign a project to an upper elementary student and emergency preparedness won't seem so scary. FEMA also sponsors a website called Citizen Corps. On their Youth Preparedness page (http://www.citizencorps.gov/ready/kids.shtm), there are lists of links for parents and educators as well as a list of links to websites with activities. Some links include PDF files to download. Links in the box on the right side of the page include links to independent study courses, safety for kids, and other resources by topic (such as a flu epidemic). For information about specific emergencies, or what to do in certain disaster scenarios, the American Red Cross has a page with information to download in a variety of languages at Preparedness Fast Facts (http://rdcrss.org/RGrQo). There is a General Preparedness guide and specific guides for disasters including earthquake, flood, hurricane, tornado, and fire. Guides are even available for what to do after the disaster, when returning home. Links in the menu in the left margin provide information online about various disaster scenarios. Other resources are also listed in this menu. Finally, for a quick download, visit http://1.usa.gov/ozL2bx for a coloring book. Sponsored by California's Emergency Management Agency, the coloring book covers topics from when to call 9-1-1 to what to do in specific disasters and emergencies. Download the whole thing or just pages that your class is working on. Perhaps the greatest reason to declare September Disaster Preparedness is the anniversary of the September 11 attacks on U.S. soil 10 years ago. High school students in particular will remember the event with the eyes of preschoolers, the age they were when the attacks occurred. For all of us, finding a way to remember, discuss and look to the future will help us feel more secure. One way to remember is to visit an archive of news. The Internet Archive (http://www.archive.org/details/911) has a page full of links to actual television footage on 9/11 and the days that followed. Also included are links to perspectives on the news coverage of the event. This website is rich with resources that would facilitate a discussion of the history of the event along with how the media covered the tragedies. For another portal to historical references, the Newseum has an online exhibit called 9/11: How It Changed US (http://www.newseum.org/exhibits-and-theaters/online-exhibits/9-11/). Their exhibit includes links to the Newseum's YouTube channel and USA Today coverage of the terrorist attacks. The previous two sites offer historical background which not only helps students remember 9/11, but also to discuss the event. What happened? Why did it happen? How has our country changed to prevent another terrorist attack? The Department of Homeland Security has links for information about what they do and how things have changed in the department in the past 10 years. An interesting page that lends itself to this discussion is the National Terrorism Advisory System (http://www.dhs.gov/files/programs/ntas.shtm). Links and downloads include information about the current advisory level, a public guide, and a FAQ page. When we look to the future, it's hard to imagine what the 9/11 Memorial will look like at Ground Zero. The National September 11 Memorial & Museum (which currently only exists online) has a page that provides virtual tours through a live webcam and an animations. You can view it all from here: http://www.911memorial.org/take-virtual-visit1 (be sure to scroll to the bottom for the link to the animations). And last, but not least, President Obama and the First Lady are urging Americans to visit Serve.gov (http://www.serve.gov/), a portal to volunteer opportunities across the country. On September 11, the First Family hopes that all Americans will remember the day by offering their time in a volunteer effort. 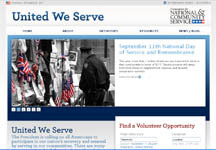 Through Serve.gov, volunteer opportunities can be matched by location and interest. There's even a toolkit for creating your own service project or event.